We in Wisconsin like our sports. With our long, cold, some would say, miserable winters, we don’t really have a choice. We need something to get us through those 10 months. Everyone has their favorite moments in sports. And without further ado, here are mine (in no particular order). And only a few months behind the other guys on this blog. Badgers win first Rose Bowl. Growing up, UW football was a joke. A not very funny joke, but a joke nonetheless. When the Badgers signed Barry Alvarez as coach, there was no reason to think that a change was in the works. UW went 1-10 in his first year. Years two and three found the Badgers 5-6. Little did I know that on New Years Day, 1994, I would be in Pasadena, CA, watching the last seconds roll off the clock, hugging the random guy sitting next to me, as UW beat UCLA to win its first Rose Bowl 21-16. I would have thought that I woul d have had a better chance of walking on the moon before UW winning a Rose Bowl. Will never forget it. On a quick side note, a few years after UW’s 1994 Rose Bowl triumph, I was thinking back on the Badgers 10-1-1 season. The Badgers lost to Minnesota 28-21. Down 14-0 with time running down in the first half, Darrell Bevell threw a pick in the red zone that the Goophers returned for a touchdown. The Badgers also tied OSU. With 7 seconds to go in the game, UW had a 32 yd field goal attempt to win the game blocked. I contend that if you change these two botched plays, maybe even just the pick against MN, the Badgers win the national championship that year. Which is probably a good thing that it didn’t happen, since my head may have exploded due to over-happiness or the sheer improbability of UW winning the national championship. UW goes to the Final Four. 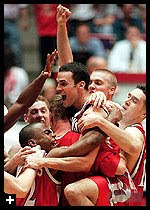 Keeping with the UW theme, as inconceivable as the Wisconsin Badgers winning the Rose Bowl seemed to me in 1994, the UW basketball team going to the Final Four in 2000 seemed even more ridiculous. The Badgers struggled to score points. In fact, they had scored an NCAA tournament record low 32 points the year before, a topic that you may see me come back to. The starting center was 6’5”. The starting point guard averaged less than 5 points a game. On the way to the Final Four, UW beat an Arizona team that started Richard Jefferson AND Gilbert Arenas. Saying the Badgers went to the Final Four still sends chills up and down my spine. The fact that I got to see UW play in the Final Four in person is one of my greatest achievements. And the fact that I had nothing to do with that doesn’t bother me at all. Packers beat 49ers in overtime. While you would think that I would pick the Super Bowl win over the New England Patriots from the 1996 season, I may have been more excited when Chris Jacke nailed that 53 yarder in OT to beat the 49ers 23-20. It was the game that made me realize that 1996 could be a special year for the Packers. This Monday night game had it all. A big comeback, controversial calls, and Don Beebe filling in for the injured Robert Brooks and going off for give or take 300 yds. Ok, it was only 220, but it seemed like 300 at the time. When the kick went through the uprights, my roomies and I sprinted over to our friends’ house 10 blocks away just to give them a high five, we were so excited. Great year. Great game. 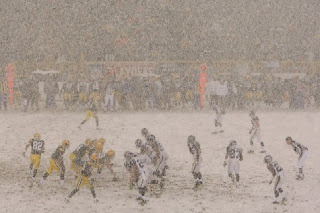 Packers beat Seahawks in the snow. This was a special one for me, as well as the entire state. My cousin, who was a ticket broker in Green Bay at the time, took me to the game as a wedding present. Turned out to be pretty much the best present of all time. Incredible game. Packers received the opening kickoff and were down 14-0 in less than 4 minutes. I couldn’t believe what I was seeing. After the Seahawks took the 14-0 lead, I feared that the crowd would be deflated as the two teams ran out for the kickoff, maybe even boo. I could not have been more wrong. It was as if the crowd just decided that, “No, we are not losing. Not today.” It was as loud as I’ve heard a stadium. Thinking of that moment still brings a smile to my face. Anyways, you know the rest. Packers score TDs on 6 straight drives, the field gets covered with snow, and Brett Favre wins his last game as a Green Bay Packer. That last part is quite bittersweet. Braunie goes deep on Cubbies. I can’t have a top five sports list without some Brewers. And you can’t get much better than a home run off the hat ed Cubs to send your team to the playoffs for the first time in 26 years. I won’t go into much detail with this one, since the other guys did an admirable job covering this moment already. The one crappy part of this moment is that I didn’t even get to see the end of the game. Literally as Ryan crossed home plate, I had to leave the Echo Tap because I had to go teach a class. At least the class was about making beer.